The New Moon on Friday June 23, 2017 is at 2° Cancer. 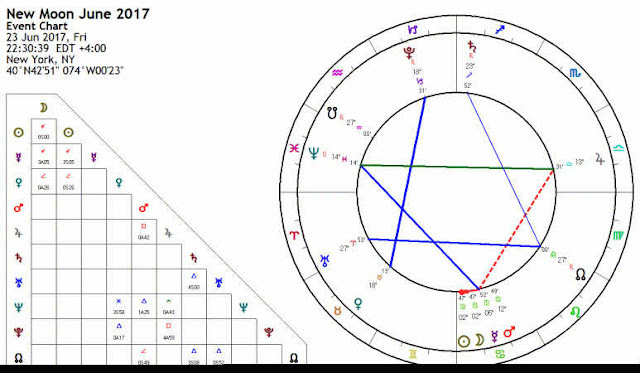 The main astrological influence on New Moon June 2017 comes from a close alignment to Mercury, the planet of ideas, communication and transport. The June 2017 New Moon is fortunately located in Gemini Constellation which is the home of Mercury. This is definitely a new moon for sharing bright ideas and making plans. The sociable new moon is ideal for making partnerships and for starting new business ventures. A new moon represents the end of one cycle and the beginning of another new 28 day cycle. Sun conjunct Moon gives an invigorating burst of energy and initiative. This is an excellent time for making a fresh start, turning over a new leaf or starting any new project. All possibilities are on the table as you put yourself at the center of plans for your future. Old habits, behaviors and beliefs can be questioned as you search for new and inventive ways to make progress. The influence of the June 23 new moon lasts for four weeks up to the July 23 new moon. The best time for making a fresh start and for beginning new projects is during the first two weeks of this new moon cycle. This waxing phase of the Moon lasts from June 23 to the July 9 full moon. 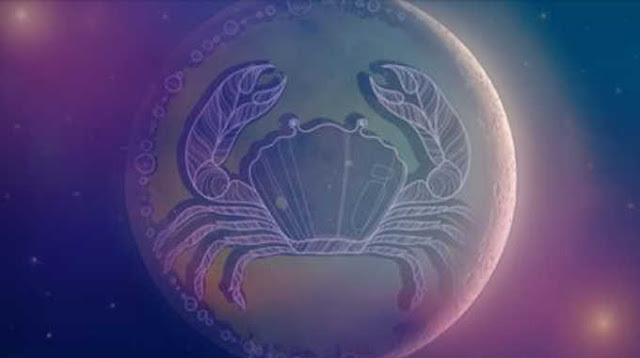 The June 23 new moon at 2°47′ Cancer is easy to decipher compared to recent moon phases. There is only one major aspect to new moon June 2017 and some input from fixed stars. While the new moon is in the first decan of the Cancer Sign, it is actually located in Gemini Constellation. Like ancient astrologers I use fixed stars and constellations for astrological interpretation, not Sun Signs. For information about this discrepancy between Sun Signs and Constellations see Precession of the Equinoxes. New moon June 2017 is only three degrees from Mercury. In this three degrees are two stars in the northern Gemini Twin. Tejat Prior and Tejat Posterior are located in the back and front of Castor’s left foot. Gemini Constellation gives intense devotion, genius, largeness of mind, goodness, and liberality. It is the House of Mercury and a fortunate sign. The conjunction of Sun, Moon and Mercury in this Mercury ruled region of the sky makes this a new moon of ideas, communication, transport and trade. Both fixed stars are like Mercury and Venus. Morse says they give the ability to express ideas in reasonable and acceptable ways which win because of their manifest intelligence. Robson says that Tejat Prior gives strength, eminence and success, while Tejat Posterior gives force, energy, power and protection. Sun conjunct Mercury puts the focus on your thinking and communications, making this a very busy time mentally. Your mind is on the ball which favors lots of interactions, clearing paperwork and bills, receiving and sending letters and emails, and short trips around town. You will be wanting to chat and start conversations on topics that interest you. Also, you will be thinking and expressing yourself clearly. This is an ideal time to make plans and start business deals, bargain, and buy and sell. Moon conjunct Mercury creates a great deal of emotional sensitivity and changeable moods. You can more easily make close emotional attachments to other people, or enjoy reminiscing about the past with family members. Conversation with women and family members in particular will be emotionally nourishing. Your emotionally sensitivity can lead to a strong intuition and even psychic abilities. Socializing should be rewarding because your openness and understanding will promote genuine friendship. New moon June 2017 conjunct Mercury signals the perfect time to make new partnerships of all kinds, personal and professional. The fortunate and protective nature of the fixed stars involved more than compensate for any relationship friction caused by the minor aspect or new moon semisquare Venus. This is a great new moon for buying and selling anything associated with communication and transport. You could bargain down the price of expensive things like cars and bikes. Keep an eyes on sales if you need a new phone or printer. The first two weeks of this new moon phase from June 23 to July 9 is a good time to share ideas and discuss plans for the future. Business deals are favored and it’s a good time for booking or starting journeys. You could take advantage of this fortune moon phase to write and send applications, schedule important meetings, make a budget or organize your paperwork. This post was republished from consciousreminder.com. You can find the original post here.